When wearing a Kimono, there are various required items besides the Kimono and the belt.Normally, all the required items are gathered in case of rentals, otherwise, you would need to prepare it yourself. The 3 main items are “Undershirt”, “dressing accessory”, “Kimono accessories”. The thing to wear under the kimono undershirt is an important item to be treated the same way as the kimono. 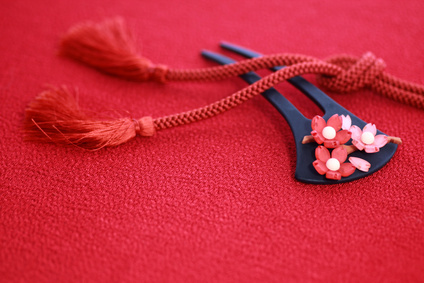 The dressing accessory is a necessary tool to adjust the kimono and is not visible from the outside. With the exception of the special kimono, such as bridal gown, you can use all kimonos in common. And when you request for a dress up such as from a beauty salon, or when you are preparing to learn the dressing method, please prepare the specified items since the tools used by teachers and dressers will differ. Unless otherwise specified, a “small set” suite is sold at the dry good stores or department stores where you can easily purchase one. The Kimono accessories are matched and coordinated with the Kimono and the obi with the items that are visible from the outside. The 4 minimum requirements are socks, decorative collar, obi sash, the obi cord.